Please come to Hamilton Hall and discover not only the most elegant venue, but one of the area’s largest! Your experience begins as you enter The Hall, see the master stairwell, and listen to your heart. Proceed up the stairs to the Grand Ballroom with its famous spring frame floor designed by Samuel McIntire for effortless dancing, next view the antique gilded mirrors and Italian chandelier. The moment you view the Musicians’ Gallery reflected in the Russian mirrors and imagine the toss of your bridal bouquet, you know a Hamilton Hall wedding is for you, your loved ones and friends. Combine romance and history for a memorable ceremony. Hamilton Hall provides the atmosphere and setting to which you can add your own personal touches. The Hall staff will work with you to make your wedding day all that you imagined it could be. There is also a lovely garden across the street available to brides and their guests. You will be joining so many other couples in the centuries’ long list of Hamilton Hall weddings. 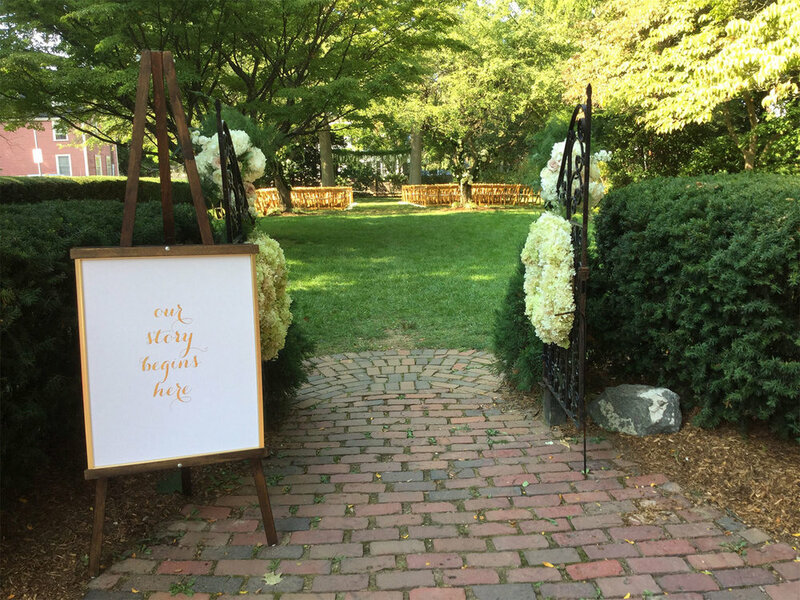 Add an elegant and gracious element to your special day with a wedding in the McIntire Garden. The garden lies across Chestnut Street on the terrace side of The Hall. It is a welcoming green space that can be arranged and decorated as you like. A garden wedding on the North Shore, with Chestnut Street as a backdrop, will be an experience that you and your guests will cherish forever. Hamilton Hall is a Registered National Historic Landmark, and does not currently provide handicap access to the second and third floors of the building. There is permanent ramp access to the first floor only. Hamilton Hall is not air conditioned and makes no promises about heat or weather conditions. No events are held during July and August without special agreement. The Rental Rates allow for a five (5) hour event. Hamilton Hall provides reasonable set up breakdown time and the Event Manager will coordinate all vendors. Only one event is held per day. Events must end by 10:00 p.m. An event manager will be on duty during the contracted event time to coordinate your event. There is no additional charge for a ceremony at Hamilton Hall if the ceremony takes place within the five (5) hour rental time. The overtime fee of two hundred fifty ($250.00) dollars for one-half (1/2) hour of time would apply if the ceremony were to take place outside of the five (5) hour rental time. If you choose to have your ceremony at the Park across from Hamilton Hall, there is a five hundred ($500.00) dollar fee for use of the Park. In case of inclement weather, $400 will be refunded and Hamilton Hall can be used as an alternative ceremony site. There is a one hundred ($100.00) dollar fee for a rehearsal held at Hamilton Hall and at the Park. Dates and times are subject to availability. Hamilton Hall maintains an inventory of two hundred fifty (250) white folding fan back chairs, one hundred and sixty (160) gold chiavari chairs and fifteen (15) 60” round tables for use within the building only, as well as high and low cocktail tables, and 6” and 8” foot tables. Hamilton Hall requires a non-refundable, non-transferable deposit of one-half (1/2) of the full rental rate. The deposit must accompany the signed contract and be returned to Hamilton Hall within fourteen (14) days of the contract date to reserve Hamilton Hall on a definite basis. Hamilton Hall must receive the balance of the rental fee, plus a one thousand ($1,000.00) dollar security deposit no later than ninety (90) days prior to the scheduled event. Payments may be made by personal or cashiers check; please make checks payable to: Hamilton Hall, Inc., and mailed to: 9 Chestnut Street, Salem, MA 01970. Notification of cancellation must be received by Hamilton Hall in writing. In the event of cancellation, the deposit shall be forfeited unless Hamilton Hall can rebook the date with a comparable rental. Should Hamilton Hall rebook the date with a comparable rental, Hamilton Hall will refund one half of the deposit paid. The service of alcoholic beverages at Hamilton Hall is governed by Massachusetts law and is limited to four and one-half (4 ½) consecutive hours. Alcoholic beverage service will cease thirty (30) minutes prior to the end of the event; non-alcoholic beverages are served for the remainder of the event. The self-service of alcohol is not permitted at any time on the property. There are many options for serving alcoholic beverages at your event, including, but not limited to, open bar, consumption bar and cash bar. Street parking is available on Chestnut Street for Hamilton Hall events. Hamilton Hall and its dedicated and professional staff encourage you to schedule a private showing to see the beauty and splendor of The Hall. Contact The Hall either by phone (978-744-0805) or by submitting this online inquiry form.